Back in 1964 I started at George Washington University. At the time there was a theater on the corner of 21st and Pennsylvania Ave a small repertory theater called The Circle Theater. It took its name from Washington Circle, which was a block or two away. Admission at that time was $1. This was at a time when the minimum wage was also $1. Across the street was an Italian restuarant named Trieste, which served pizza with enormous mushrooms, and at which I ordered martinis to impress my dates with my sophistication. I can confess now, the statute of limitations having presumably run out, that I was nineteen, underage for martinis, and the restaurant didn't check my ID. So a typical date might be a double feature at the Circle, and pizza, or something else, at Trieste. The movies offered at the Circle were your typical art house fare. Silent movies, Marx Brothers, French and Italian movies. So I saw a lot of these, among them were some of the early Soviet films, Potemkin, Ten Days That Shook the World (October) and others. I think I saw Ivan the Terrible parts I and II in the days before I got married, but I might be mistaken. *My recollection forty years on from that class is that there are, or were, right-wing and left-wing Gogolians. The left-wing variety lean towards socialist interpretations of Gogol, particularly things like Dead Souls (Мёртвые души) . Now I'm rambling on like this because I want to explain why I have some feeling for Russian literature and film. Some friends of mine who I worked with for some years are from the Ukraine, and they gave me a set of Eisenstein's sound films. Those films are Alexander Nevsky, Ivan the Terrible Parts I & II. So lets see what I have to say about these movies. 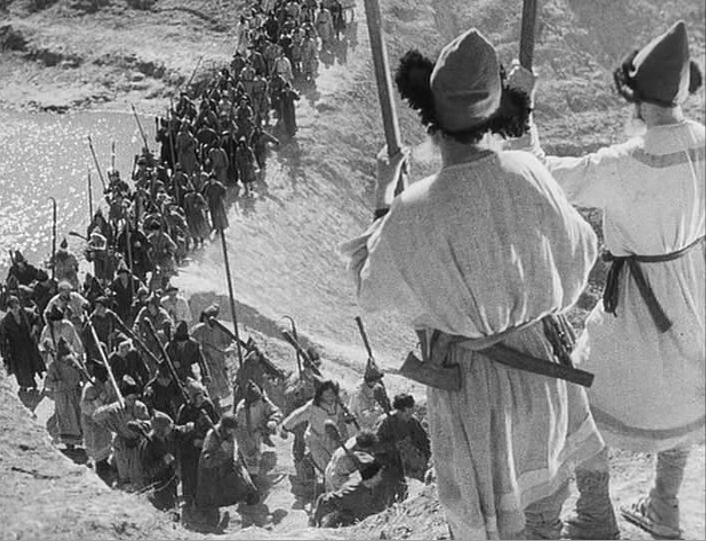 Alexander Nevsky —Eisenstein made two efforts at sound films before this. The first was Que Viva Mexico, which was never finished, and the second was Bezhin Meadow, which was censored and mostly destroyed. At the time (1937) the Soviet Union and Nazi Germany were in an antagonistic relationship. 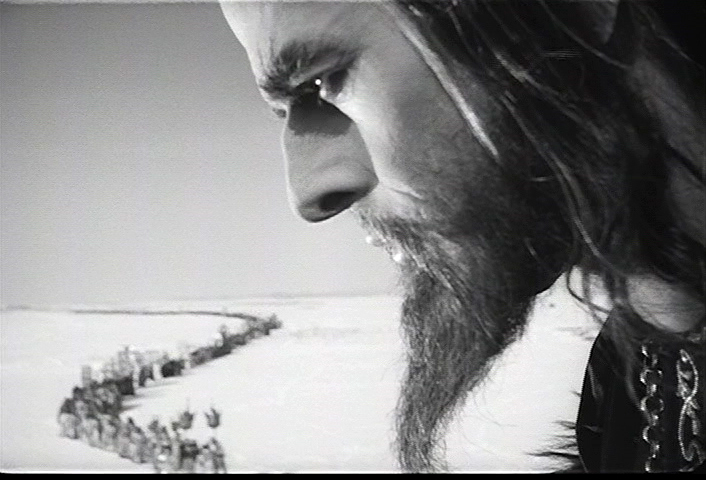 The leadership decided to do an anti-German propaganda film, and Alexander Nevsky was chosen as its subject. Nevsky fought against the Teutonic Knights, and inflicted a crucial defeat upon them in April 1242. So he served as the perfect model for Soviet propaganda against the Germans. I haven't seen any discussion of the production budget, but Eisenstein's two previous efforts had been subject to cost overruns, and his budget may have been constrained here. I think this shows up in the shots with battle axes. The blades seem to be handled more easily than 5 or 6 pound blades would be, of course that might be my faulty experience and judgment. Leaving that minor issue aside, the plot is concentrated, a single story focused on a single individual, though there is a comic/romantic sub-plot involving warriors under Alexander. The battle sequences, and you'll find this noted elsewhere, influenced later films such as Lawrence of Arabia, and a multitude of others. There is also some carryover from Eisenstein's earlier work. The anti-religious feeling from Old and New is present. The German knights are accompanied by an evil Catholic bishop who wishes for everyone to be united under Rome. I didn't notice this in my recent viewing, but he is supposed to have swastikas on his miter. So the Germans, even in 1242 were evil Nazis, and the Catholic church a bunch of evil Nazi supporters. * Russian religiosity is displayed more simply and less emotionally. The film works as a masterpiece of propaganda, and the battle scenes are stirring and effective. However, because it was effective anti-German propaganda, it fell out of favor in 1939 when the non-aggression pact was signed, and Stalin became, in Trotsky's phrase “Hitler's quartermaster.” It returned to favor when Hitler attacked the Soviet Union. About 37 minutes in there is a shot, the one on the left, that is reminiscent of the end of Ivan the Terrible, Part I. As you can see the composition is strikingly similar. The figures of authority, in the case of Alexander Nevsky the guards, stand on the right, and the people move from the upper left to the lower right, and the figures of the guards dominate the people. In Ivan the figure of the Czar occupies roughly half the screen. Ivan is shown in extreme close-up and dominates the people, who are shown in miniature, and recede into the infinite distance, both photographically and geographically, of the landscape. While the figures from the earlier film do not seem to have any symbolic function, the figure of Ivan seems to function symbolically in at least two ways. The figure of Ivan can be described as brooding, and to my mind it recalls the image of Deuteronomy 32:11, the eagle brooding over its nest to incite the young forth. In this case Ivan is relatively benign, and he brings protection to his people. It also conveys the image not of a benign paternalism, but of the madness that will follow. Ivan functions as an analogue to Stalin, so it may well be that the image of Ivan conveys initial paternal protection turning to madness and terror. Ivan the Terrible, Part 1 —Ivan is usually seen as a reflection, in some sense a parallel version, of the life of Stalin and the Russian Revolution. There's some truth to that, but you can't draw a simple 1 to 1 correspondence between Stalin and Ivan, or between the events of Ivan's reign and the Russian Revolution. There is a general parallel, but that's it. Part 1 traces events from the time of Ivan's coronation and marriage to Anastasia Romanovna to the death of the Tsarina and the establishment of the Oprichnina (1565). Unlike the Soviet Cheka, which lasted, under various names* until 1991, the Oprichnina only lasted about 6 or 7 years, and was disbanded in 1572. The Oprichnina is Ivan's instrument for suppressing opposition by the boyars (high ranking nobility) to his reign, and to forge a nation out of the disparate parts that made up medieval Russia. While any discussion of the parallels between the Oprichnina and the KGB is more appropriate to Part 2, it is perhaps better to get some of the explanatory details out of the way at the outset. The parallel to Stalin is that Stalin, following the premature death of Lenin, was attempting to defeat the political opposition led by men like Trotsky, Radek, Zinoviev, and Kamenev. The purge trials eliminated the anti-Stalin opposition, and enabled Stalin to consolidate his power. It should also be kept in mind that Article 58, what Solzshenitsyn refers to in The Gulag Archipelago as “The Law” began not under Stalin, but under Lenin, and there is no parallel or allegorical figure to Lenin in either film. 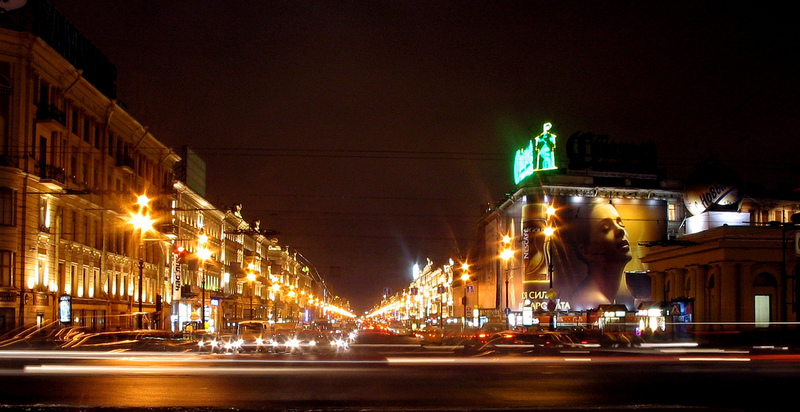 Prince Kurbsky is perhaps the closest to Trotsky, but again there is no one to one correspondence. *See this Wikipedia article for a list of Soviet intelligence/secret police agencies. Part 2 deals with the conspiracy of the Boyars against Ivan. Here the analogue would be the show trials of the Old Bolsheviks, and of the Trotskyites. Again, the analogy should not be pushed too far. The Soviet censorship apparently saw the analogy, and Part 2 wasn't released until a few years after Stalin's death. Mikhail Kuznetzov who plays Fyodor Basmanov, the lead agent of the Oprichnina is hauningly and ethereal beautiful. The only other actor I've seen that has that ethereal quality about his appearance is Kyle Schmid, Henry in Being Human. In both cases they play evil characters. While Eisenstein, who was, and as far as I know, remained an atheist until he died, wouldn't appreciate this, I found myself thinking of Paul's line about even if an angel of light should appear and preach a different gospel. Insane delusions on my part aside, these films are essential viewing for the light they shed on film, on history, and on Russian history. They are also, if you can stand to read subtitles, and some people can't, great and enjoyable films in their own right.